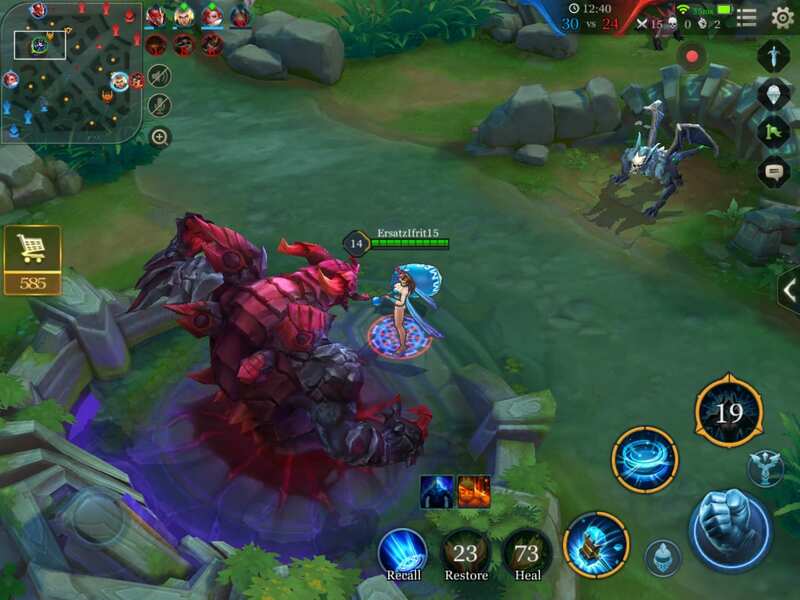 Learn the basics of pushing through and controlling the Top Lane (Dark Slayer Lane) by reading our Top Lane guide for Arena of Valor (AoV). Which Hero should go to the Dark Slayer Lane? What is the Dark Slayer Lane? The “Dark Slayer Lane” refers to the side lane which the Dark Slayer can be found near. This is occasionally called the top lane as well. Since Arena of Valor flips the map so that players are always starting from the left, however, the lane is not necessarily at the top of the map. The Dark Slayer is marked by the following icon. Players can easily find the Dark Slayer’s location by locating the mark on the map, no matter which side of the map they start on. Why is it Sometimes Called the Top Lane? Arena of Valor is a MOBA game similar to other titles League of Legends and Dota 2. Both of these games have a similarly important creature located in the same area near the top lane. Additionally, bot matches will orient the match so that the Dark Slayer is near the top lane as well. As such, many consider the Dark Slayer lane to be the ‘default’ top lane. Warriors or tanks are the best heroes to go to the Dark Slayer lane because it is usually defended by heroes with high defense. Also, when the team has a jungler, it is best for two heroes to go to the Abyssal Dragon lane while one lanes near the Dark Slayer. This is due to the fact that teams will be able to challenge the Abyssal Dragon much earlier than the Dark Slayer and thereby will need to be ready to fight or contest the dragon earlier in the match. In the early stages of the game, there will usually be at least one hero protecting their tower. If not a single hero, two will be defending the tower. This is usually the most balanced and peaceful matchup you could hope for. As long as there is no one trying to kill each other, you can easily farm EXP and gold by slaying minions. You can try to kill the enemy hero if they get too close, but watch out for an ambush from their jungler. Likewise, be ready to assist your own teammates, should they come to try and gank your opponent. It is important for you to avoid taking damage when there are two opponents in lane. Wait for the minions to come under your tower so that you can farm them more safely. You still gain gold and experience without last hitting, but the amount you receive is greatly reduced. However, your allies can benefit from this situation. As two enemies are busy dealing with you on your own, your allies will have an easier time with their own lanes. Additionally, you will gain experience at a faster rate than your opponents, not having to split it with an ally. Choose your armor based on your opponent’s main damage source. If your opponent is a mage, defend yourself with magic defense, and if he/she is a marksman, equip armor that reduces physical damage. Level by killing minions that wander outside of their range. If the opponent gets close to the tower, you can safely attack them. The tower will immediately lock onto them should they retaliate. If your jungler is near, you can call for back up and eliminate the opponent together. You can additionally call an ally for help if you are running low on HP. That way you can return to the base to heal without letting your opponents push too hard. The mid-game usually starts after the tier one towers start falling. Depending on who’s tower fell, your strategy will be different. If you manage to knock down your opponents’ tower, move to the other lanes to assist them in pushing. From this point on, team clashes will start to happen more frequently, so travel with allies to avoid getting caught and ganked. The important thing at this stage is to stay close to your allies so that you are always ready to support them. The importance of the Dark Slayer decreases as the game goes on. Winning team fights is much more important at this stage of the game, so there is no need to stick to your lane. Just be careful of the enemy minions who will be slowly creeping down empty lanes to destroy your towers. Don’t let them push too far, as they can easily knock down unattended towers.